B U B B L E G A R M: Wardrobe revamp + How to flatter your bust shape! Wardrobe revamp + How to flatter your bust shape! I'm sitting here tonight thinking of revamping my wardrobe, I always get like this before the new year approaches. I have so much clothes that I don't wear for several reasons. I was trying to sort out in my head about what I should and shouldn't keep, and it got me thinking twice about what actually suits my body shape. Bigger breasted women can look alot heavier than they actually are. Here are a few simple tips on what to look out for when trying to look slimmer. By all means wear low cut cleavage popping necklines but remember that there is a time and a place for everything. Opt for deep V necks instead as this will be slimming giving the illusion of a longer neck therefore distracting away from the breasts. High or rounded necklines will make you look top heavy. Try wearing a long skinny cotton scarf wrapped around once, with both long bits hanging at the front to break up the proportions if wearing a round neckline. Wear a waist belt to clench in your waist to reveal a more proportioned silhouette. Make sure that the end of your necklace doesn’t end right on the largest part of your breasts. A longer length that reaches to your stomach or a shorter length will be more flattering. Avoid thin straps and opt for thicker straps instead to offer you support and balance out the proportion. Wrap dresses and tops are great as they accentuate the waist and distract away from the breasts. Make sure you are wearing the correct bra size, this will make a HUGE difference as it will lift and support. And look below at Kim getting it wrong even though she is wearing a waist belt and V neck. Why did she get it wrong? Because she is wearing a top underneith the dress that cuts her at the wrong point, her hair is out and ends right on her breasts creating more fuss and volume where it shouldn't be. She has also worn shoes that cut her at the ankle making the proportions look off. 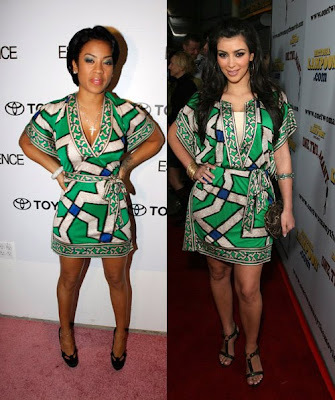 Keyshia Cole on the left got it right. A smaller bust is great, in fact you can pull of almost any style whilst looking classy. You don't have to worry about anything popping out or looking trashy. Here are some of my tips. Opt for higher or rounded necklines, stay away from V necks as this will only make your breasts look smaller but, a rounded V may work. Wear frilly and patterned tops around the bust area to introduce detail and create volume. Avoid thick strips as it will make your breasts appear smaller, thin spaghetti straps are much more flattering. Wear chunky or layered necklaces to create more volume around the breast area to create more dimension. What are your tips? I'm getting rid of any of my clothes that don't fit, make me look fat, and make me look blah. I'm keeping all my clothes that make me feel special and I aim to dress 'special' everyday. Start the new year as you mean to go on! Every year I do the same, I check my wardrobe, and despite the fact that some stuff insist on looking at me and saying " pleeease let me staaay", I refuse, cause I know they are only getting on the way of nicer stuff to come (more shopping Oh my :o ) haha... And yes, a good bra works wonders !!!!! Excellent tips! I am of the bigger bust persuasion and I haven't thought of many of these tips before...thank you! These are great tips! I'm a small girl (5'1), but have a bit of a Dolly Parton look going on. LOL! I need to get some more v-necks A.S.A.P.! I agree that Kim Kardashian does dress well for her shape. I just found this video of her showing some of the things in her closet - http://www.fashionair.com/index.php?action=watch&itemID=41406 - you might have to search on the site if the link doesn't work. love this post and very handy, especially the part about not creating a fuss around the bust area if well endowed, with your mane and necklaces, frumpy dresses etc.! seriously though, i couldn't recognise keisha cole, i love that girl, so glad she's lost the orange hair!